Stained Glass Church Doors & other vintage and antique items we have found in our travels which go well with antique and vintage lighting. 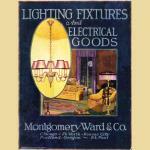 Know more about Vintage Lights through social media sites. You can share your thoughts, join us, follow us, view our pictures and can read about the products.